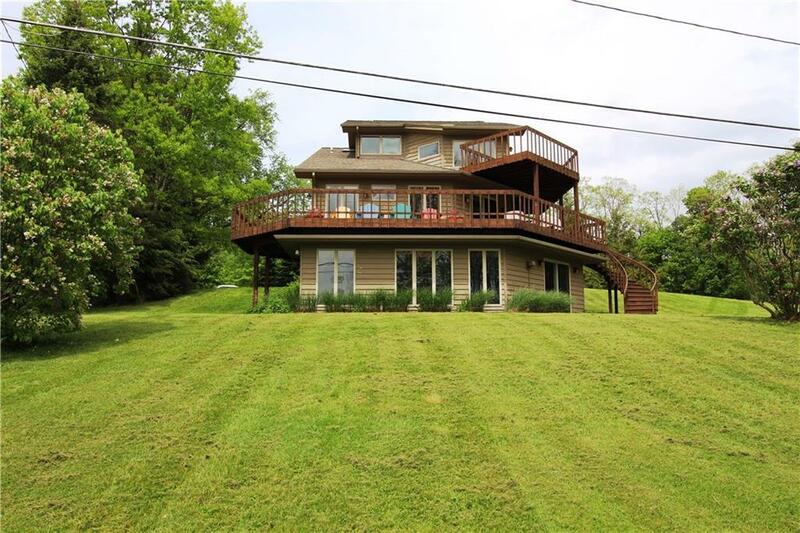 A perfect year-round home situated on a 2.5 acre rolling lakefront lot with panoramic lake views from two decks, a patio, and many of the rooms in the house. The first floor features a large open concept great room with wrap around deck with a covered portion which is perfect for shelter on rainy days and a large open area to enjoy the sunshine. On the second level, there is a large master suite with walk-in closet, updated bathroom, and private balcony overlooking the lake. The second level also includes two additional bedrooms and another bath. In the finished ground level, you will find a large family room, sleeping alcove, patio, laundry room, and another half bath. An attached two car garage adds to the convenience plus there is a large storage building for recreatiional equipment. Directions To Property: Rt 430 Just Past Driftwood. Look For Sign.